I grew up playing Cowboys and Indians, watching Roy Rogers and Gene Autrey movies on TV and viewing westerns at the theater with stars like John Wayne, Randolph Scott and later Clint Eastwood. 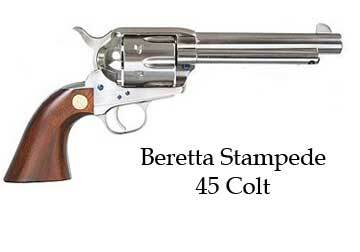 It’s natural for me to be attracted to old cowboy guns like the Colt 45 Single Action Army and it’s variants. Colt knows people like their guns and they’re priced accordingly. A genuine Colt SAA is way out of range of my gun budget. That doesn’t meant I have to do without, however. 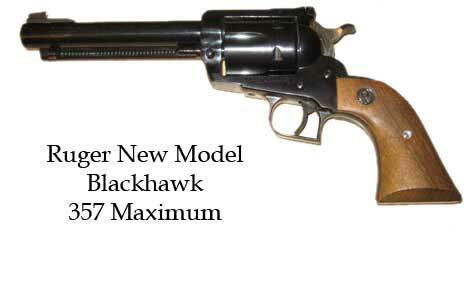 In a previous article I’ve described my Ruger Blackhawk 357 Maximum. This is a gun I honestly purchased because of the way it looked and the price. It was $300. I didn’t know at the time that Ruger had recalled and discontinued it’s line of 357 Maximums, supposedly because of top-strap burning due to the heavy loads of the 357 Maximum cartridge. Evidence later emerged that the only incidents of the top-strap buring were the result of reloaders loading excessive charges. My gun has absolutely no evidence of any damage whatsoever. In fact, it’s nearly pristine. Even with the Ruger, I’ve had a hankering for a true SAA clone for sometime and last year decided on a beautiful stainless steel Beretta Stampede. I was debating between a Ruger Vaquero and the Stampede and settled on the Stampede for two reasons: I’ve already got a Ruger revolver and the Stampede was available for less money than the particular Vaquero I would have wanted. 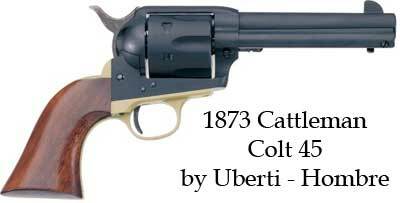 It turns out the Stampede is made by the Italian Company Uberti, known for its authentic clones of Old West guns. The action was smoothed at the factory and this is one pistol I’m proud to own. You’d think I’d have been satisfied, and I guess I was until cruising by the gun counter at Outdoor World and seeing an under $300 price tag on a new Uberti Hombre in 45 Colt. In fact, with a little inquiry I learned that I could apply a discount and get this particualar 45 Colt Cowboy pistol for $270. So I did. Then I went shooting. It was a fun day at the range with a box of 45 Colt cartridges from Black Hills ammo and some Winchester 38 Specials for the Ruger Blackhawk. First I shot the Uberti. I’m going to show you the targets below, but I’ll be honest, this gun really surprised me. I had the targets out about 15 feet. I took a steady aim and the first shot went almost dead center of the target. I fired another one that touched the first one, and honestly the third shot went into one of the first two holes so that I was three shots in with only two holes in the target. I was impressed. The action was smooth, the gun well balanced. Nothing wrong with the workmanship. Wow. I fired a couple of cylinders full, then put up another target for the Beretta. The Beretta Stampede grouped well, but slighlty left of point of aim. Recoil on either of these two guns was minimal. I found myself curling my right pinky under the grip for support. I didn’t think much about it, until later at another gun range I heard an old Cowboy Action Shooter tell his buddy that was his secret for shooting Cowboy guns accurately. Interesting. I’d just stumbled across something that worked for me and later found out it’s a secret of the experts. I had recently adjusted the sights on the Blackhawk and boresighted it at the office. This was its first trip to the range after that adjustment. I fired part of a box of 38 specials and was pleased with the results. Experience has proven the Blackhawk is just as accurate with 357 or 357 Maximums as with the 38 Specials, just a lot louder. Here are the targets for all three guns. You can see for yourself, the old Six Shooters are pretty darn accurate, even with their minimal iron sights. Time constraints and bum knees may prevent me from it, but I’m getting a hankering for some Cowboy Action Shooting as sponsored by the Single Action Shooters Society (SSAS.org). Even if I don’t do the SASS thing, I’ll enjoy plinking with these guns and someday they’ll get passed along to the kids and/or grandkids. I’ll probably add a couple of .22 caliber models to the collection within the next year. Both Ruger and Uberti are making 10 shot 22’s. Ubertis can be converted to 22 Magnum. Now that’s really cool!